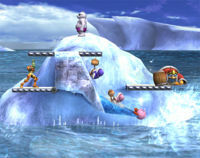 The Summit is a new stage in Super Smash Bros. Brawl, acting as the Ice Climbers stage. It takes place on a huge chunk of ice with a couple of platforms hovering above it. For the first few parts of the fight, the chunk of ice stands firmly still on the top of Icicle Mountain. After a certain time passes, the stage breaks off, and lands in the water with mighty force. However, players can still fight while the stage is falling, but the stage will be tilted slightly. Once the stage reaches the water, it will stop tilting to and fro, and will be much easier to stand on. However, this doesn't stop the stage from tilting up and down. The Polar Bear will land on the top of the stage once it has reached the water, and occasionally push it deeper into the water. When this happens, a large, orange fish (that actually originated in the Balloon Fight series, not in Ice Climber) will leap out of the water and attack other players. If the fish grabs a player in its mouth, the player will be dragged below the water and lose a life. Players are able to fight under the water, so long as their feet touch the ground. Additionally, the platforms on the stage are able to flap up and down. The Summit reappears in Super Smash Bros. Ultimate. In the debug menu of Super Smash Bros. Melee, there is a stage named "IceTop," which freezes the game when selected; due to the name, it is possible that Summit (or a predecessor thereof) was planned to appear in the game. This is the third time the fish has appeared in the Mario franchise; the fish first appeared in the WarioWare series. In WarioWare, Inc.: Mega Microgame$!, it appears in the microgame Balloon Fight. The Fish is seen again WarioWare: Smooth Moves in another microgame called Balloon Fight, and in the unlockable minigame Balloon Trip. This page was last edited on March 14, 2019, at 15:12.